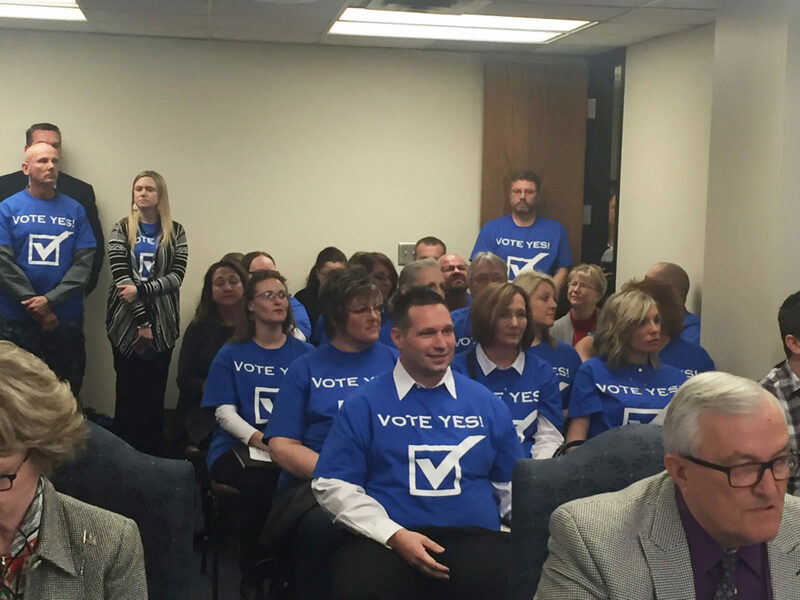 Supporters of a charter school in Seminole showed up in blue shirts at the State Board of Education meeting Thursday. A unanimous vote Thursday by the State Board of Education sends a message to public school boards across the state: If you won’t sponsor a charter school, we may do it instead. The Seminole Public Schools board had twice rejected the application for the Academy of Seminole, and the state board took up the application on appeal. In a packed boardroom after several hours of discussion, the board voted to sponsor the school itself. In amending the Charter School Act in 2015, the legislature made several changes that paved the way for the Seminole charter. It opened up charters statewide – previously charters were restricted to the state’s urban areas – and it allowed the Board of Education to sponsor up to five charter schools per year if the applicant had been denied by the local school district. More than 100 parents and community members attended the meeting to show support for the proposal for a charter school with a curriculum based on science, technology, engineering and math, or STEM. The school will at first offer 11th and 12th grades but plans to expand to preK through 12th within three years. It will initially share space on the Seminole State College campus. “It’s a historic moment,” said Robert Ruiz, executive director of Choice Matters, an Oklahoma City-based organization that promotes charter schools. The message, he said, is that school boards should consider charter applications based on merit, regardless of politics. Others in public education viewed the decision as a loss of local control. Seminole community member Marilyn Rainwater also had concerns. The Academy of Seminole is set to become the second charter school outside of Oklahoma City and Tulsa. Carlton Landing Academy, a former private school in a small community on Lake Eufaula, became the first when it opened in 2016. Carlton Landing Academy is sponsored by Canadian Public Schools, although its board reluctantly voted to approve the school. The Canadian board president said board members felt if they rejected the proposal, the school would appeal and the state Board of Education would sponsor it anyway. In Seminole, a town of 7,500 residents about 55 miles southeast of Oklahoma City, a rift developed over its public high school building. Twice voters have rejected bond proposals to build a new high school, and the 87-year-old historic high school building has since been declared unsafe for occupancy. Students are now being educated in a converted retail building that was most recently a call center. Division over the first proposal in 2015, which was to build a new school on the east side of town, came to a head when dueling full-page advertisements appeared in the Seminole newspaper, The Oklahoman reported. University of Oklahoma President David Boren, a Seminole High School alumni, came out against the idea, while oilman and former Seminole Mayor Melvin Moran was a proponent. The second proposal attempted to satisfy both sides by preserving some of the historic building while rebuilding the rest. It, too, was defeated. In considering the Seminole proposal, state Superintendent of Public Instruction Joy Hofmeister laid blame for the bond proposals’ failure on the school board. Paul Campbell, president and chief executive of the Seminole-based aerospace manufacturer Enviro Systems, is driving the charter effort. He formed Advance Rural Education, an Oklahoma foundation applying for 501(c)3 status to support the charter school. The Kentucky native, who was appointed to his post in 2015, said his company struggles to recruit engineers because they don’t want to send their children to Seminole schools. The academy plans to contract with ResponsiveEd, a charter school operator based in Lewisville, Texas, to manage the Seminole academy. The school must still seek the state school board’s approval of a contract. Lee Denney, a former legislator who co-authored the 2015 bill to amend the charter school law, is on the Academy of Seminole’s governing board. Currently, the state Board of Education sponsors one charter school, Oklahoma Youth Academy Charter School, which operates in the state’s incarcerated boys’ facilities in Tecumseh and Manitou.